Just a note on the statistics; they are a reflection of where the bike goes between setting off in the morning to arriving wherever I will be sleeping in the evening so include seemingly endless cycles around towns to find tourist offices or frequent doubling back to correct myself when I take the wrong road. I reckon you would have to knock off 10% of the total distance to make up for these ‘diversions’. So finally today I arrived at a campsite, much to my relief as there were times during the afternoon when I thought it might be on sleeping on a park bench. Basel was not really what I expected. A grimy, dark city surrounded by industrial areas. It was more like Brussels than anything else in that part of France. I cycled east in the general direction of the Swiss cycle network route 3, hoping to bump into it at some point and to my delight, I did, in a suburb of Basel. My delight was not to last. Back in the UK I dreamt of cycling in Switzerland; beautiful roads, sign posts at every corner, polite drivers… Well the reality didn’t initially meet my expectations. The roads were on a par with France but not Luxembourg. The sign posts were good but far from perfect; the road signs didn’t give distances and were nowhere near as frequently placed as they are in France, the cycling signs had gaps which left me scratching my head. I was almost ready to jump on a train at one point when the Swiss redeemed themselves in the form if a middle-aged couple who pulled over to ask the blatantly obvious question “are you lost?”. Sunday is not the best day to arrive in Switzerland. The place shuts down. Added to that the fact that today is the annual national holiday. Aarau was a ghost town, I rattled the door of the tourist office in vain. I scoured the map to find reference to a campsite; nothing. Even the hotels (second option) appeared to have closed their doors. Bugger! I sat on the steps of the tourist office pondering my options. Stay put and make a greater effort to find a hotel? Expensive in Switzerland. Wild camp? Not really an option in an area that is not “wild”; you would more likely than not be camping in someone’s garden. Cycle on to the next town with a campsite…. It was the only option so I set off to Sursee, 30 kms down the road but at least in the direction I needed to go; halfway to Lucern. Tired but relieved I arrived at around 5pm after 100 kms which included a very significant climb. On the positive side, I’m now within spitting distance of Lucern – in effect, one and a half days ahead of schedule and have spent a very pleasant evening chatting with a father and son team of bikers, Carl & Nick who are busy making plans to cross the Alps and then head west towards Argeles near the Spanish border. We’ve just had a storm and the forecast for the next few days isn’t brilliant. 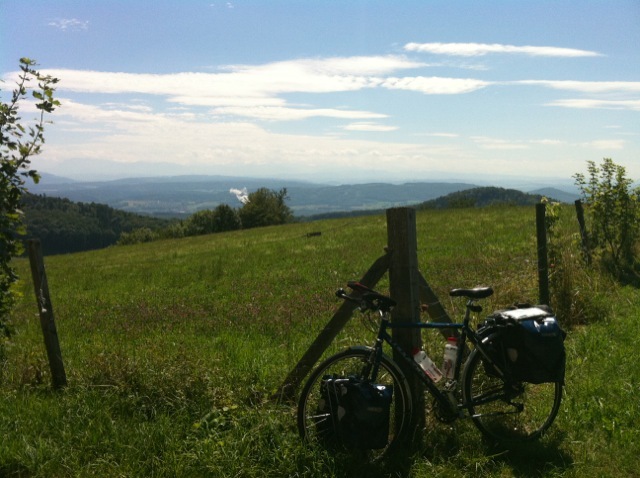 I feel a day off coming, perhaps even tomorrow after having cycled the short distance to Lucern. Any suggestions? These are the kind of days that give you something to remember. The easy days are so easily forgotten. Keep up the good work – I’m watching your progress!